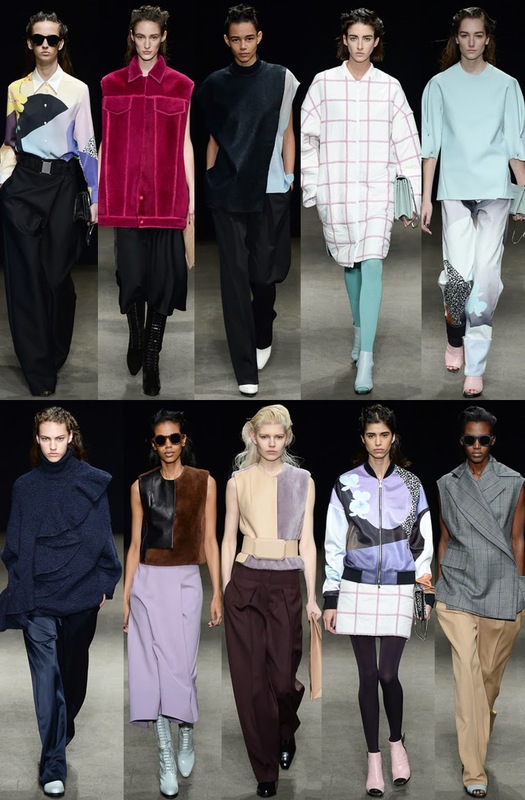 Onto the second installment of my NYFW coverage (told you I had you, wink!) and so far, what I've observed as the mot d'ordre across the board is layering, outerwear (to-the-knee coats and shearling bombers, more specifically), long & lean silhouettes, midi pencil skirts, muted palettes, clean lines and pops of neon. Shall we proceed? Probably one of the most luxe, confident collections we've seen from his namesake label, ever. It felt so polished and grown-up, without having lost so much as an iota of its quintessential cool factor. His penchant for fashion technology (who could forget his glow in the dark effort for spring 2013) was part of the program too, with heat-sensitive outerwear, as well as a battalion of models who looked strong enough to brave any Polar Vortex, and then some. The Wang girl will know no weather woes next year. The Australian Designer would still be considered a newbie to NYFW (his 2nd season here) but the mark he's making indicates that he wouldn't mind staying a while. Bursting onto the scene not that long ago with his intricate leather detailing work (having friends like Christine Centenera advocating your work doesn't hurt either), he distanced himself from that this time around, showing his ability to grow. For this collection, he revisited his homeland with references to the Outback (hello, croc sculptural leather! ), all the way to jail gear (baggy grey pinstripe, a nod to how the island was colonized). His silhouettes were impressive and his craftsmanship even more so. It appears that ever since Olivier Theyskens and Theory officially became one (sans the prefix last name), his girl has grown up and become more polished. Is there anything wrong with that? Not at all, but the clothes he now sends down the runway are more pragmatic than fantasist, more sharp and less urban. Again, nothing wrong with that. I still felt lusty. One of my favorite collections of the week so far. To me, this was flawless, exquisite in ever way. It was luxurious, it was unpretentious, grown-up yet youthful, über-chic, clean, unfussy, feminine but not that obvious. Whatever fashion dreams Victoria is selling, I'm buying by the boatload. Who doesn't love plaid and a soft palette of greys, creams and anthracite? His shapes felt fresh and on-trend, while his geometric prints captured my attention. 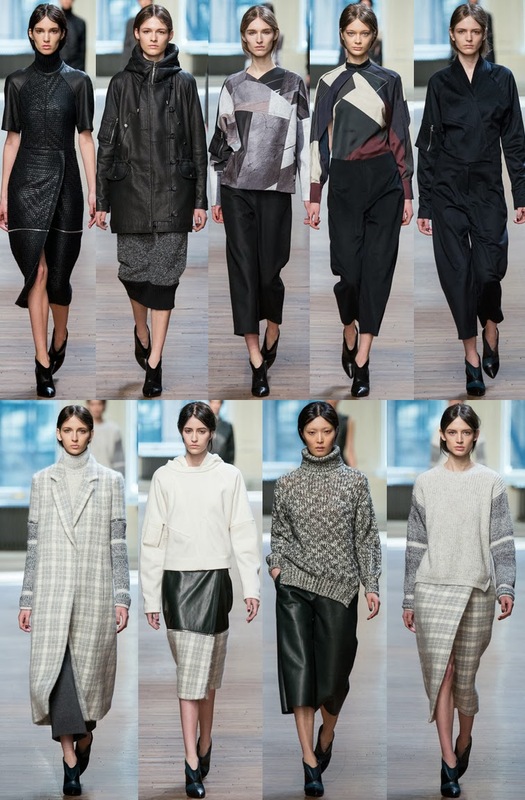 A perennial NYFW favorite, Mr. Lim has never failed to induce a lot of feelings of desire in me. For fall 2104, his color palette went from light to dark, first exploring pastels by way of plaids and Miami Vice-esque prints, then progressing into deep cabernets, mysterious navies, without forgetting chic black and white. His recurring statement: trousers à la Katharine Hepburn and oversized easy elegance. Dashes of fur and leather here and there to solidify the cold weather offerings and a few chunky knits for good measure. Can you tell I loved it? Beautiful collections. 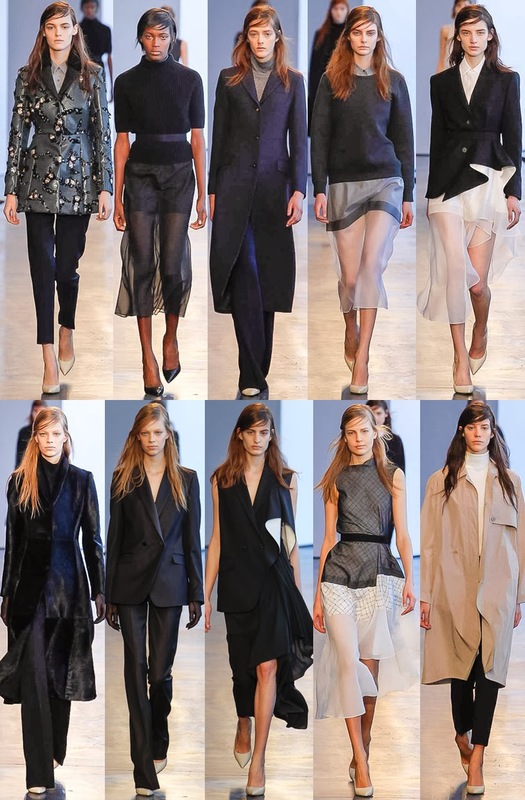 My favorites would have to be the clothes in the Theory collection and the clothes in the Yigal Azrouël collection. 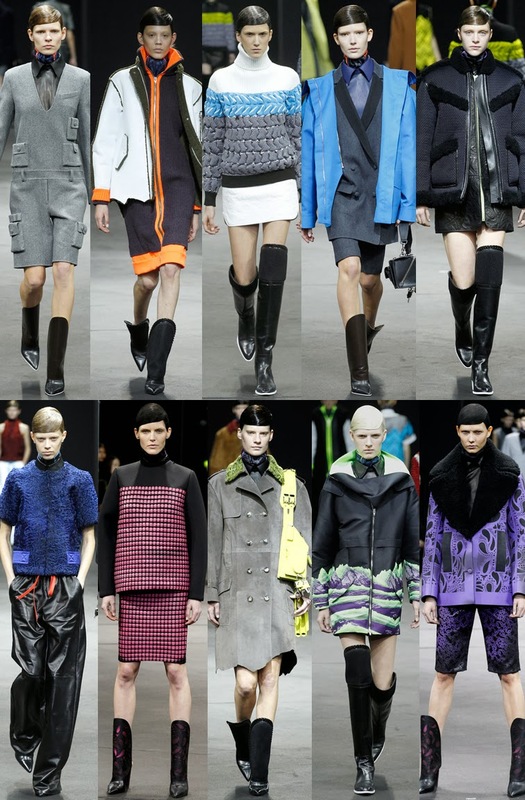 I love the colors in the Alexander Wang collection. But am I the only one that find it a little creepy that all of the models are styled exactly the same with hair that makes me think of the plastic Ken doll hair? Loved Wangs show - such a production and those boots and mules! I also loved how VB has gone slightly grunge chic and Just looking through Marc Jacobs pics just now from the show. Great post - loved reading it. gorgeous gorgeous!! so many things I want from these brands! This season looks so promising. Love it. This is an amazing roundup of the collections, love the modern lines. !